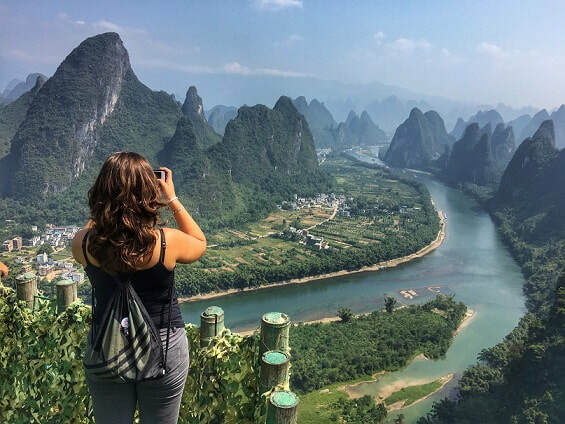 ​Join our team for this 14 day Amazing China Tour including the best things to do in Guilin, Chengdu, Xining, Zhangye, Xi'an and Beijing. 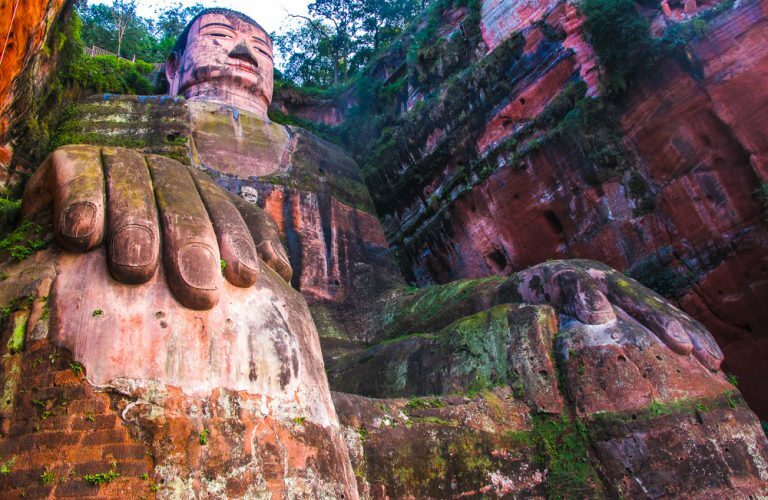 The Amazing China Tour features three full days in Guilin, two full days in Chengdu, two full days in Xining, two full days in Zhangye, one full day in Xi'an and three full days in Beijing. 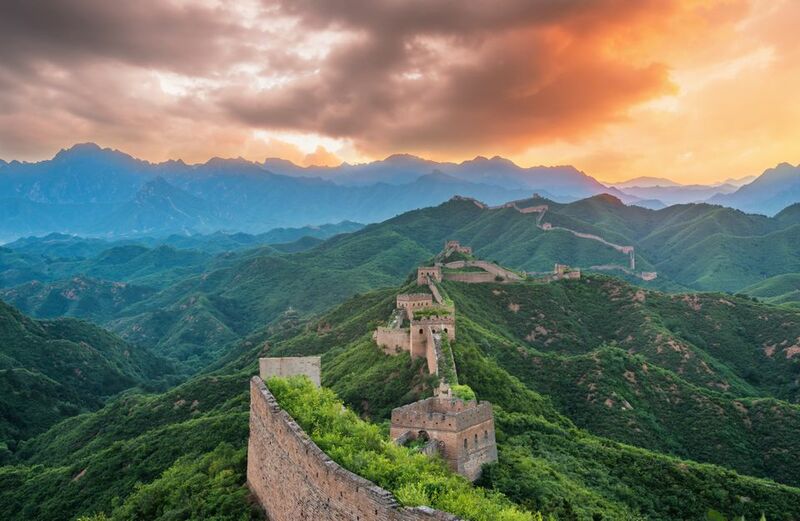 This 14 day tour includes the Li River, the Rice Terraces, Pandas, Qinghai Lake, the Rainbow Mountains, Terracotta Army, Great Wall of China as well as other top attractions in each destination! 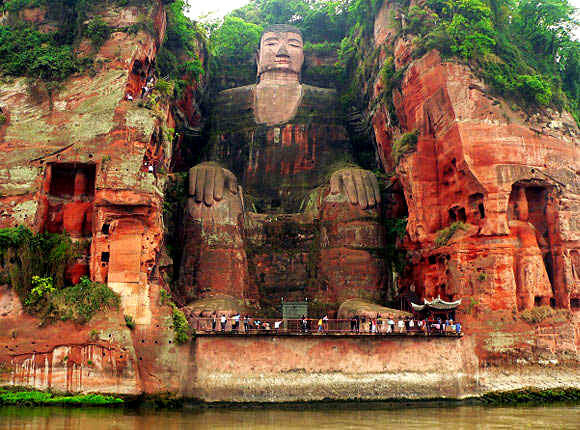 Please note, if you'd like to find out the latest pricing for our Amazing China 14 Day Tour, please contact us directly. Arrive into Hong Kong the day before your tour is scheduled to begin as the tour commences in the morning. Alternatively, we can also schedule the tour to begin from Hong Kong Airport, Hong Kong West Kowloon Railway Station or any other ports of entry upon your arrival. To begin the first day of the tour, your tour guide and driver will meet you at your Hong Kong Hotel in the morning (time is flexible based upon train departure information) for the transfer into Mainland China. From Hong Kong Kowloon West Railway Station, it takes approximately 3.5 x hours to Guilin via the high-speed train. There is a Hong Kong/China Customs in Hong Kong to ensure efficiency and please ensure you have your China visa (if this is required)! In the afternoon, you'll arrive into Guilin Railway Station with your tour guide awaiting your arrival at the train exit gates in Guilin. After arriving into Guilin, you'll visit the first attraction of your tour with a stopover at Diecai Hill in the city center. Diecai Hill, also known as Folded Brocade Hill was named after its rock formations and is home to somes incredible stone carvings as well as beautiful views overlooking the city of Guilin. Please note, it does require a walk up to the top of the hill (at your own pace) but the views are worth the time spent walking up! 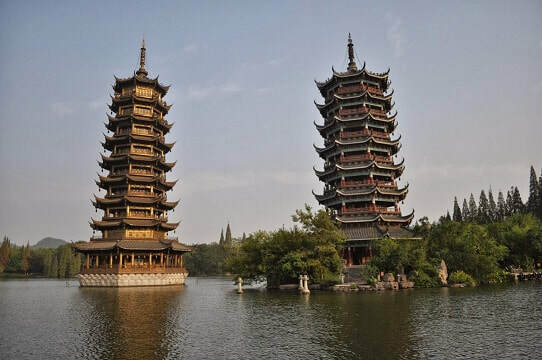 Following the visit to Diecai Hill, embark on a Guilin City Lakes Walking Tour featuring views overlooking Elephant Trunk Hill and the Riyue Shuangta Cultural Park (Sun and Moon Pagodas). The remainder of the evening is at leisure. Meet your tour guide in the morning with the first stop being the Reed Flute Cave. The Reed Flute Cave is a famous limestone cave located on the outskirts of Guilin city, on the way to the Rice Terraces. 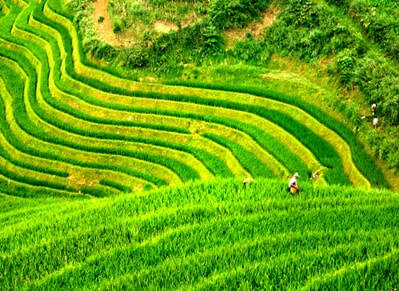 After the cave visit, you'll then depart to the Longji Rice Terraces, which takes approx. 2 x hours from Guilin or 3.5 x hours from Yangshuo. 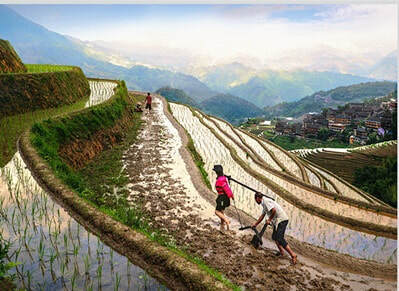 Upon arrival, you will walk to the Longji Zhuang Ethnic Minority Village, which is a quieter village. During your time at the village, experience firsthand local’s daily lives and see the traditional architecture featured on both the older and newer buildings . 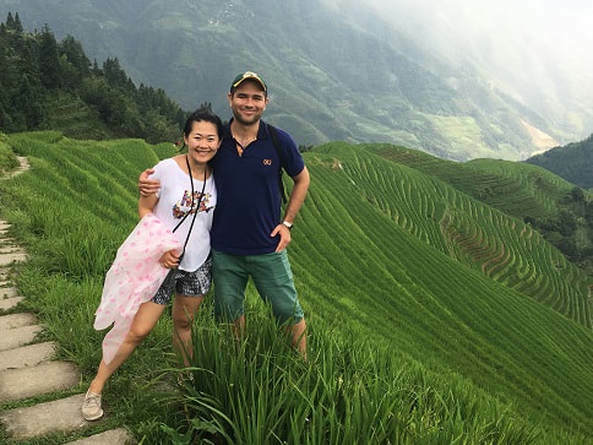 In the morning, your tour guide and driver will meet you at your Guilin Hotel Lobby to commence the day's activities, focusing on the scenic mountains and charming beauty of Yangshuo. The entire Yangshuo area is located approximately 1.5 x hours south of Guilin and the first stop along the way is a visit to Xianggong Hill. 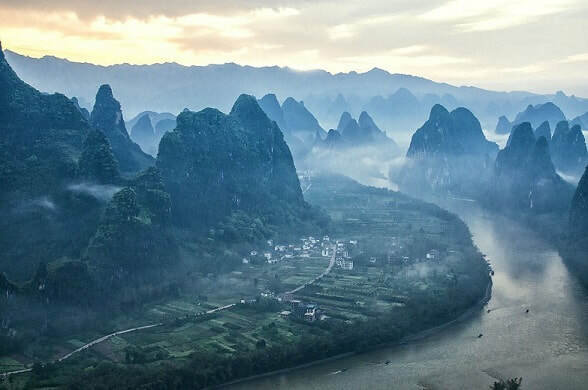 ​Xianggong Hill is a mountain located in the Putao area between Guilin and Yangshuo, offering incredible views overlooking the Li River, karst mountains and surrounding scenery. From the base of Xianggong Hill to the viewpoint it takes approximately 10 - 15 x minutes to walk (depending upon pace) and it is an uphill walk (with hand railing available) so please take this into consideration. 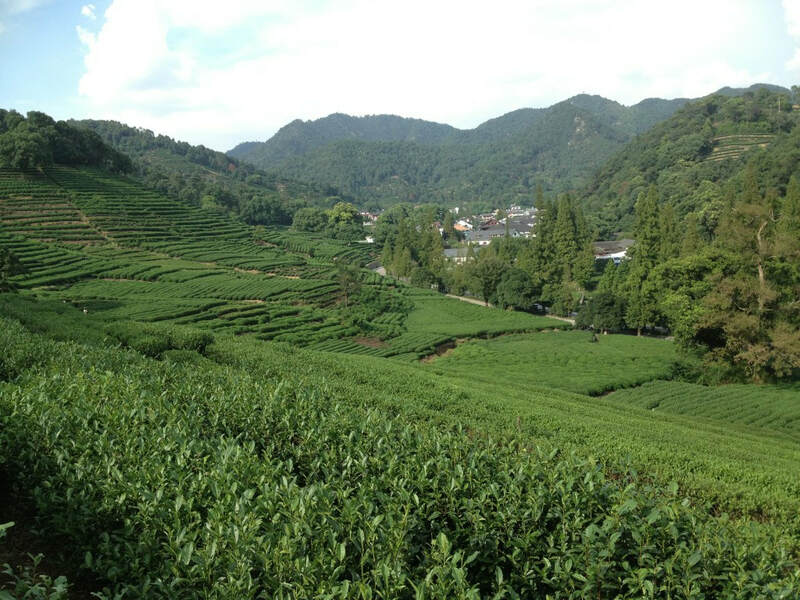 Following the visit to Xianggong Hill, you'll continue traveling to the Yulong River for a countryside walk (or cycle). Please discuss with your tour guide on the day based upon your preferences and either option can be accommodated. Visitors can also visit the nearby scenic bridge (Fuli Bridge) and enjoy the afternoon in and around Yangshuo. 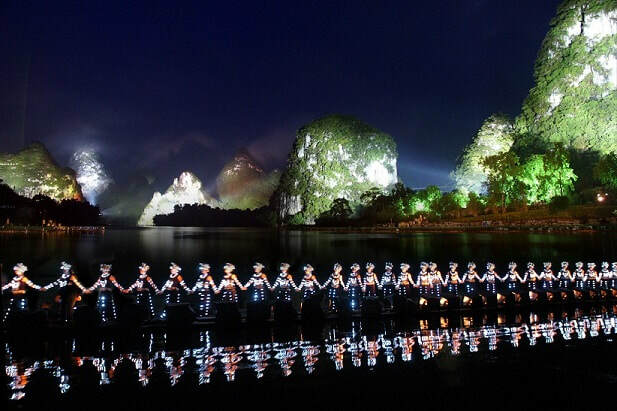 ​In the evening, watch the famous Impression 3rd Sister Liu Show held on the banks of the Li River from your VIP B1 Seats. ​This show is a grand performance featuring over 700 actors and actresses and was directed by Zhang Yi Mou - the director and choreographer of the opening ceremony at the Beijing Olympics in 2008. The tour will conclude upon returning to your hotel in Yangshuo to enjoy the remainder of the evening at leisure. 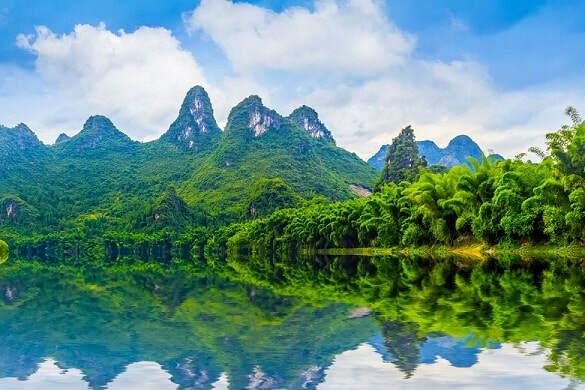 To begin the day, you'll meet your tour guide and driver at your Yangshuo Hotel lobby and travel to the nearby Yulong River for a drifting experience. The Yulong River is a famous for its picturesque scenery offering a contrast to the towering Karst mountains found along the Li River. You'll board a bamboo raft and slowly drift downstream whilst admiring the beauty of the river. Afterwards, transfer to Guilin Airport for your flight to Chengdu. From Yangshuo to Guilin Airport, it takes approximately 1.5 x hours and the flight duration from Guilin to Chengdu is a similar duration. Flight details and suggestions can be provided. Upon landing into Chengdu, your Chengdu driver will meet you at the domestic arrivals gate and transfer you to your Chengdu hotel. During the evening, you'll be introduced to some local foods during a Chengdu Food Tour before being transferred back to your hotel at the end of the food tour. In the morning, your licensed English-speaking tour guide and professional driver will meet you at your Chengdu Hotel Lobby. 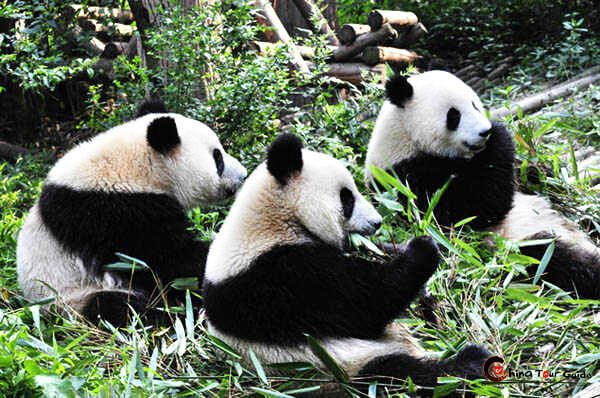 Thereafter, travel for approximately 1 x hour to the Chengdu Panda Research Base. The morning is the best time to visit the Pandas when they're at their most active! 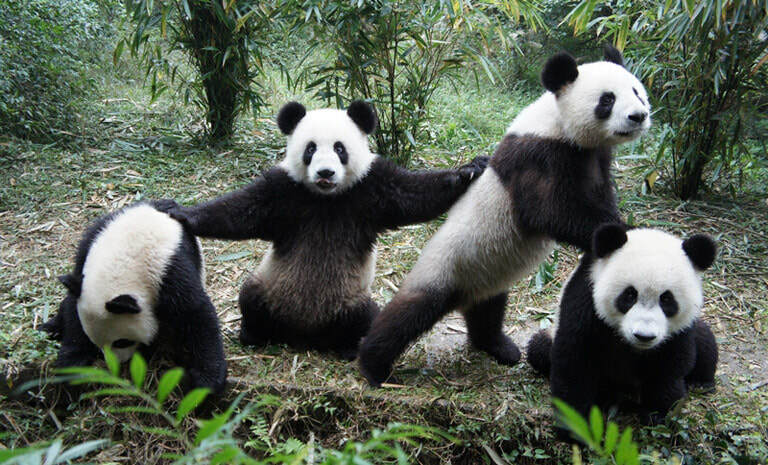 Upon arriving at the base, visitors will have the opportunity to see pandas of all different ages. Moreover, the keepers feed them in the morning, allowing visitors the best time to see these magnificent animals in real-life! If you're lucky, you'll have the chance to see babies from as young as 1 month old to 3 years old, adult pandas as well as the red pandas. Within the Chengdu Panda Research Base , there's also a scenic bamboo garden as well as Swan Lake, which are nice stopovers. 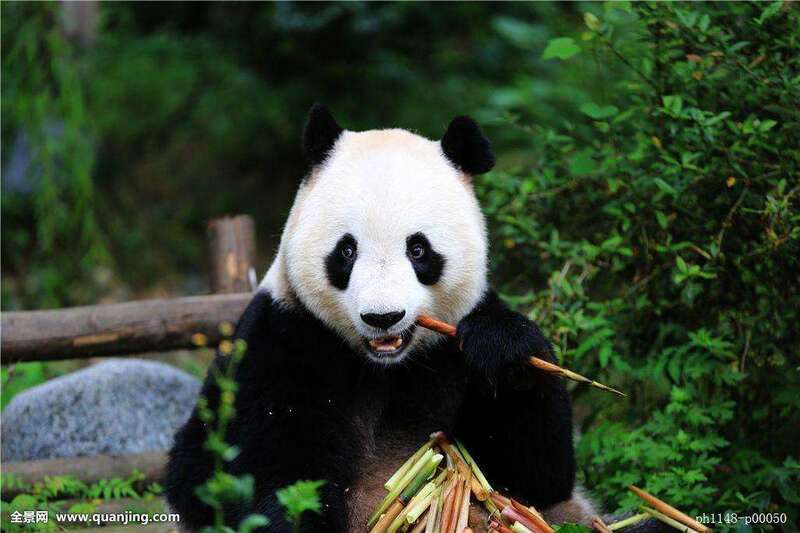 ​You'll depart from the Panda Base at approximately midday and be transferred to Chengdu Airport for your flight to Xining (flight isn't included but we will make recommendations based upon timing). Upon arriving into Xining Airport, your Xining driver will be waiting at the arrivals gate and transfer you to your hotel in Xining to enjoy the evening at leisure. For today's tour, due to the significant driving required, it's necessary to start the tour early and we'd recommend meeting the tour guide and driver at 7:00 am. 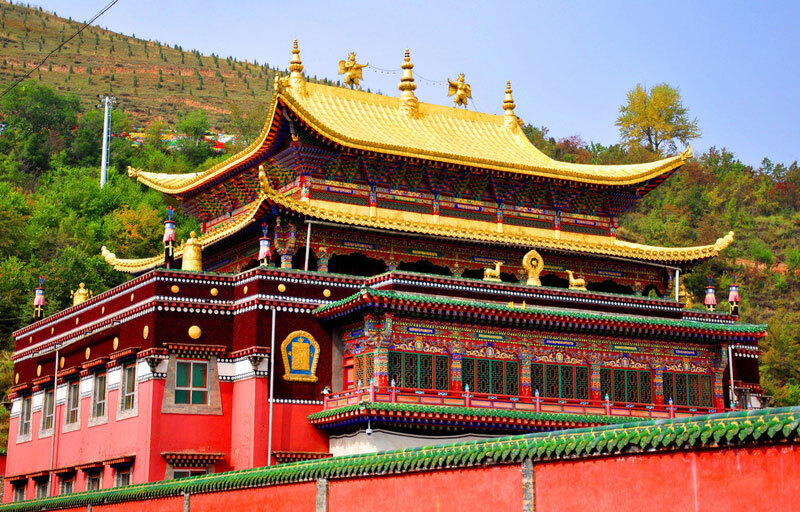 The first stop is the Kumbum Monastery, located in the nearby town of Huangzhong. ​The Kumbum Monastery (Tai-Er Temple in Chinese) is the second most important monastery in Tibetan Buddhism and a highlight of the day. Visitors will explore a number of different sections of the monastery and learn some brief insights into Tibetan Buddhism. Following the visit to the Monastery, we'll depart and visit some spectacular scenery along the road from the Kumbum Monastery to the edge of Qinghai Lake. Highlights of this journey include snow capped mountains at Laji Mountain and Riyue Mountain, a number of pagodas, stopover at some Tibetan Yurts to taste some local cuisine and learn about the local culture. In the late afternoon, continue towards the edge of Qinghai Lake, where you will visit China's largest lake on the Qinghai Plateau. The scenery changes throughout the day ranges from mountains to lakes to deserts, offering a little of everything for visitors. At the conclusion of the day, you'll be transferred back to your hotel in Xining to enjoy the remainder of the evening at leisure. ​Begin the day by meeting your tour guide and driver at your Xining Hotel before being transferred to the Dongguan Grand Mosque. 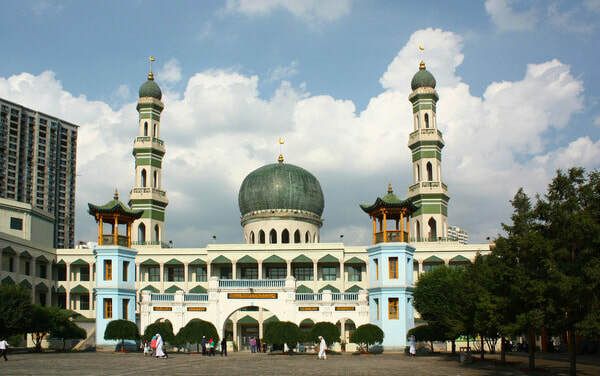 The Dongguan Grand Mosque is the largest mosque within Qinghai Province whereby approximately one third of the popular are Muslim. ​With over 600 years of history and being located in central Xining City, the Dongguan Grand Mosque is a great place to visit to gain a further understanding of Xining as well as see some beautiful architecture. 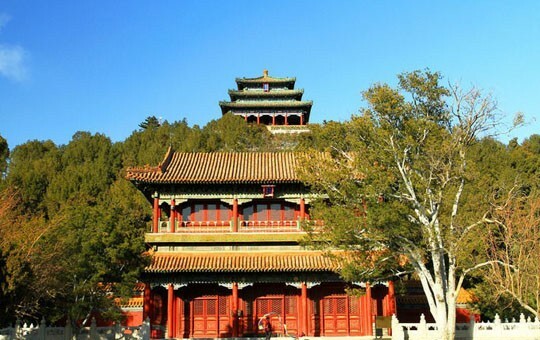 Following the visit to the Dongguan Grand Mosque, you'll be transferred to Xining Railway Station to board a high-speed train from Xining to Zhangye. The train takes approximately 2 x hours and travels further North-West along the Ancient Silk Road. 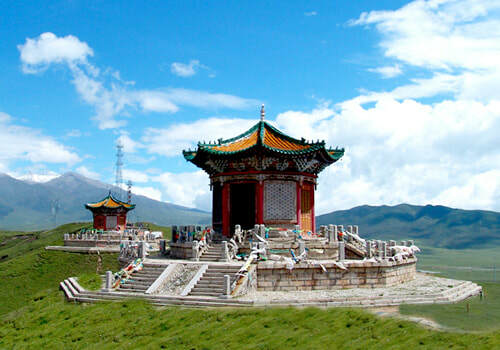 Upon arriving into Zhangye, you'll travel to the Horse Hoof Temple (Mati Temple) located on the outskirts of Zhangye. 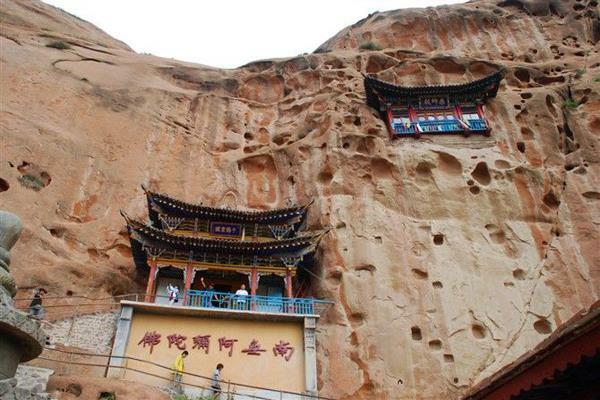 ​The Mati Temple are important Buddhist Grottoes located on the Linsong Mountain Range. Featuring various temples and grottos built into the side of a cliff-face, this attraction is a perfect introduction to Zhangye. 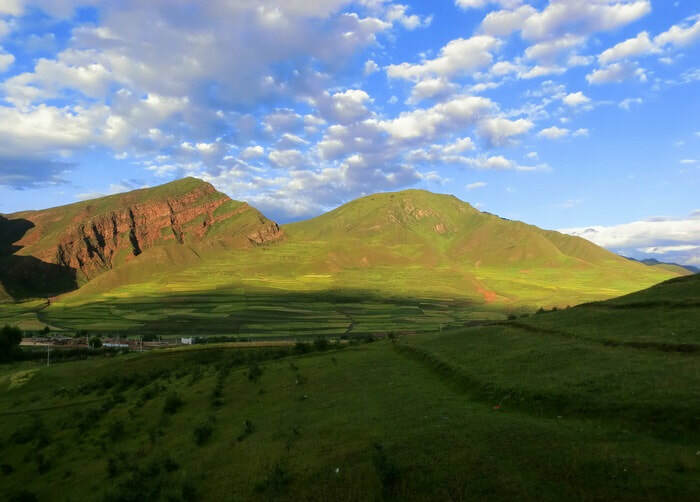 After the visit, you'll return to Zhangye, check-in to your Zhangye Hotel and enjoy the remainder of the evening at leisure. After meeting the guide and driver at your Zhangye Hotel lobby, the first attraction to visit is the Giant Buddha Temple in Zhangye. 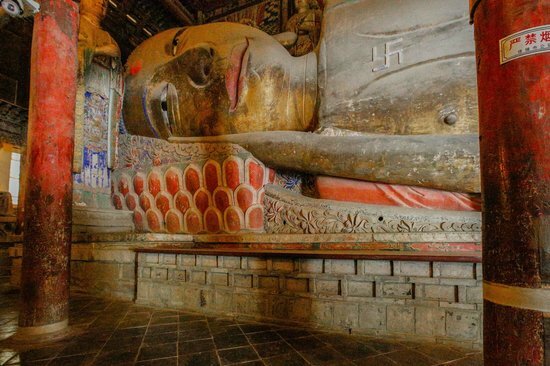 The Giant Buddha Temple, also known as Dafo Temple, is in central Zhangye and is famous for its large reclining Buddha within the temple. It was first constructed in year 1098 and is over 35 meters long, making it a popular attraction for travelers visiting Zhangye. 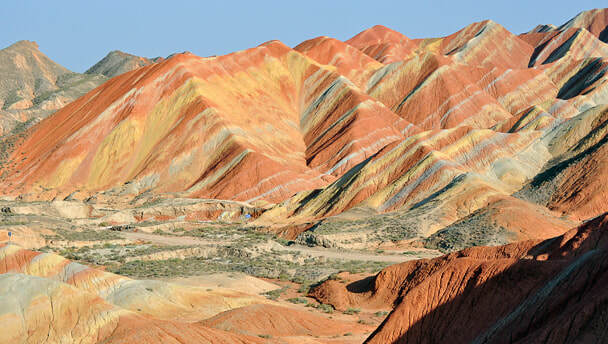 Following the visit to the Dafo Temple, you'll also stopover at a local Ethnic Minority Family's House for a quick visit before having lunch and traveling to the highlight of the region - the Zhangye Rainbow Mountains National Geopark. 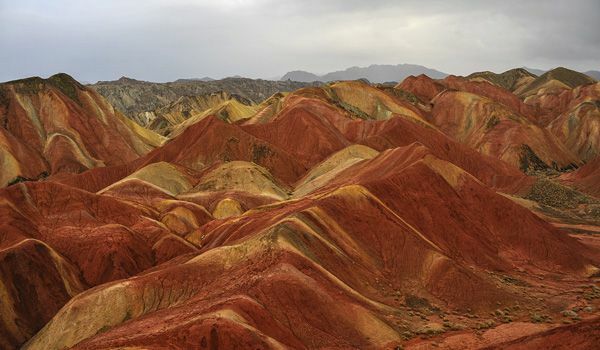 During the afternoon, you'll explore the Zhangye Rainbow Mountains Geopark - home to the world famous rainbow colored mountains. 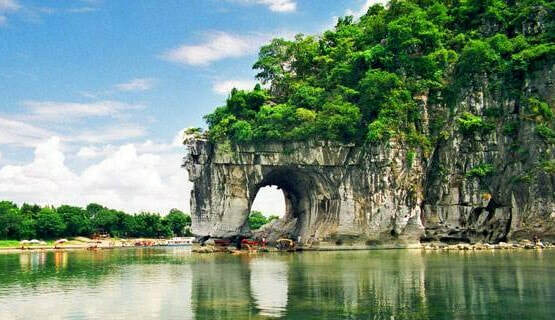 Within the Geopark there are a number of different areas to stop and overlook these incredible formations. Visitors are required to take a public bus within the geopark and timing is flexible at each viewpoint with the final viewpoint being most popular during sunset. There is also an additional area, which is fenced off (it has less visitors) but requires an additional fee to enter for those interested in visiting. Afterwards, you'll be transferred back to Zhangye City to your hotel where you will enjoy the remainder of the evening at leisure. Meet your tour guide and driver at the Zhangye Hotel Lobby and commence the day. 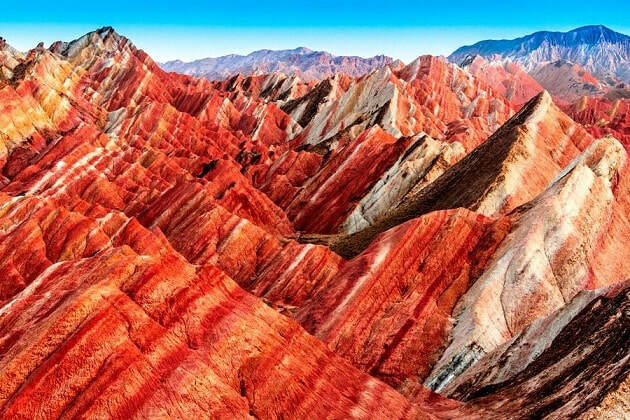 Aside from the Zhangye Rainbow Mountains, a lesser known but almost equally scenic attraction within Zhangye area is the Pingshan Grand Canyon. Whilst this canyon isn't as popular as the world famous Grand Canyon in the USA, it's incredibly beautiful and most visitors are very surprised when visiting. 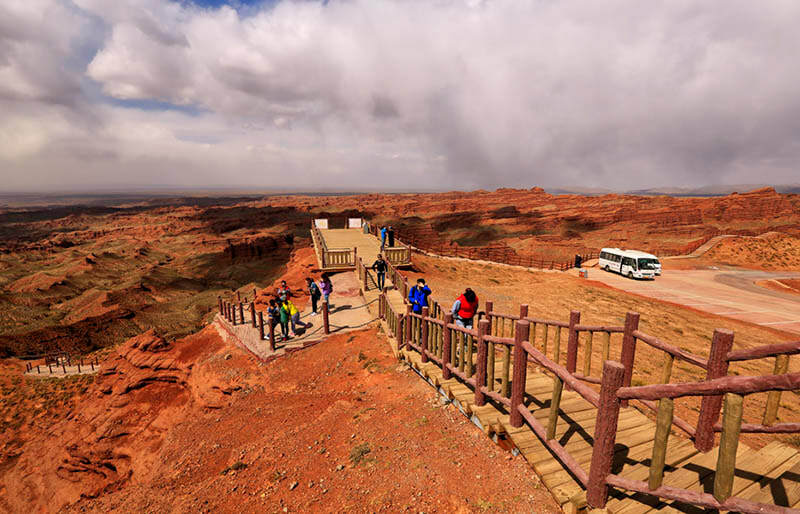 Similar to the Zhangye Rainbow Mountains Geopark, there are public buses transiting visitors throughout the Grand Canyon park to different viewpoints. Following the morning around the Pingshan Grand Canyon, visitors will be transferred back to Zhangye Airport to board their flight to Xi'an. From Zhangye, it takes approximately 1.5 x hours to fly to Xi'an and upon landing you'll be transferred directly to your Xi'an Hotel to relax during the evening. To begin the Xi'an part of the tour, our tour guide and driver will meet you at your Xi'an Hotel Lobby. We'd recommend a 9:00 am meeting time but because it's a private tour, this can be flexible so please advise your preferences. 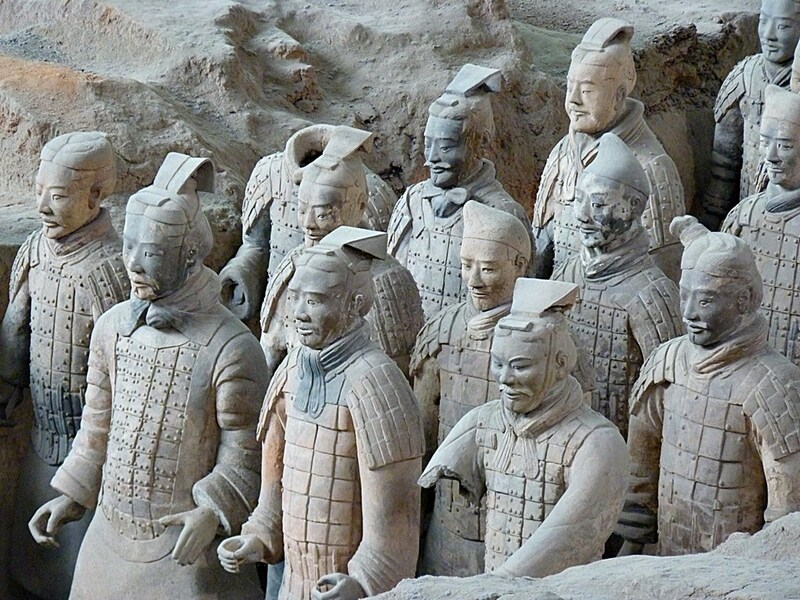 Thereafter, depart for the Terracotta Army, which is located on the outskirts of Xi'an City. 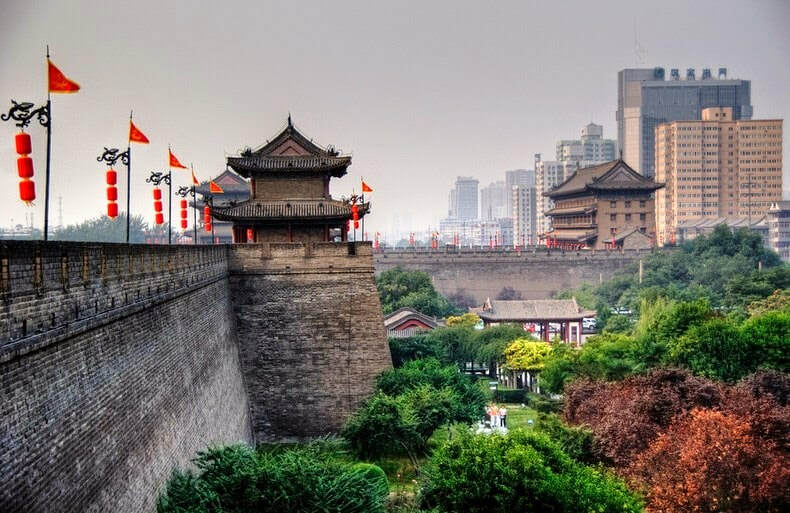 After the visit to the Xi'an City Wall, visitors will continue exploring Xi'an with a visit to the Muslim Quarter - a small area of Xi'an particularly renowned for it's local snacks and souvenirs as well as background. 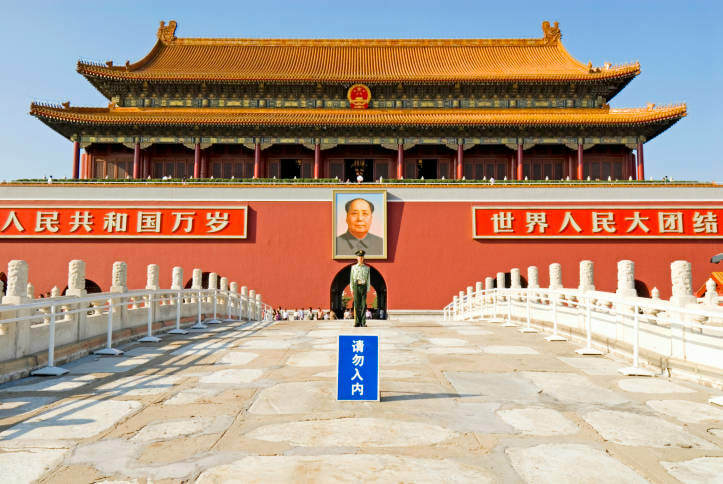 At the conclusion of the Muslim Quarter visit, visitors will then be transferred to Xi'an Airport (or Xi'an Railway Station) to board a connecting flight/train to Beijing. Upon arrival into Beijing, transfer to Beijing Hotel and relax during the evening. 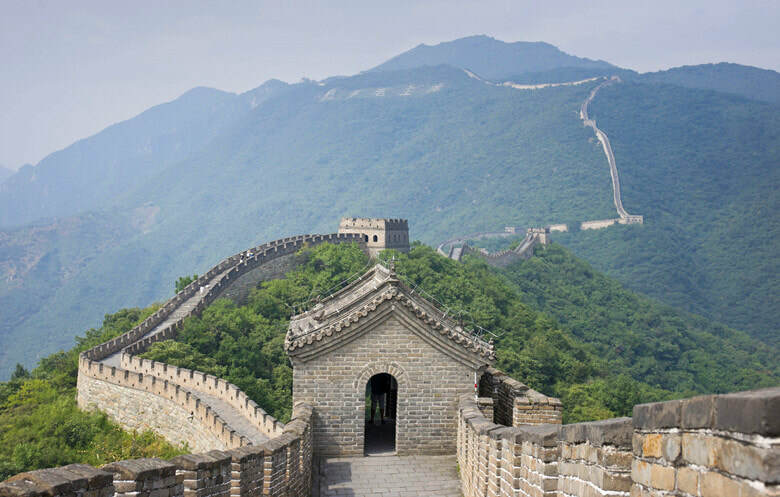 To begin the first day of the Beijing tour, your tour guide and driver will meet you at your Beijing Hotel at 8:00 am (time is flexible based upon your preferences) for the day tour to the Great Wall. 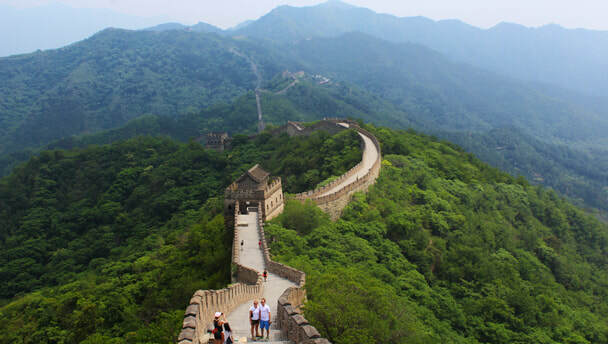 We will travel to the Mutianyu Section of the Great Wall of China, which is located in Huairou County (approximately 1.5 - 2 x hours drive from Beijing).